Cape Froward, the southernmost of the South American continent. Knowing nothing about the future and not being allowed to stop, you are sometimes forced to keep going in fear of your life. The period of sailing in the Chilean Islands, Patagonia, had been one of such hard days. Aomi, heading for Cape Horn, is running in the Strait of Magellan with a specially made small sail (1/4 of the standard storm-sail) which I call "super-storm jib." The width of the strait is about seven miles here. On the water, there are waves with its peak curling and breaking green. On a closer look, there are even numerous ripples on the slope of the waves―it is a sign of the high wind. "What a strong wind! It is too strong!" I thought in the spray passing me from behind. Honestly speaking, I am frightened so much. I pull the downhaul rope and lower all sails, but Aomi is still running to the east in the Strait of Magellan with the force of the wind blowing the mast. Though there is no sail which works as a damper for rolling, the run is quite stable somehow. I go into the cabin, ignite a Primus burner and make lunch. "Is it possible to arrive at the next anchorage before sunset?" I muttered. If it gets dark before arriving there and I lose sight in the darkness, Aomi will hit a rock or go aground in such a narrow strait and so strong wind. The black mountain in the photo, Cape Froward, is the southernmost of the South American continent. All the land south of here is a group of islands which continue up to Cape Horn. After passing in front of Cape Froward, I would like to change the heading from the east to the north and head for Punta Arenas. By the way, after Cape Froward, what is the wind like? In a narrow strait between mountains, the wind tends to blow along the channel. There will be two possibilities of the wind after Cape Froward. Case 2 (red arrows): If the direction of the true-wind is between the North and the Northwest, a strong wind (a thin red arrow on the right) blows from the North-northeast. It is a headwind. If the latter case becomes a reality and the strong headwind blows, it is almost impossible to sail windward while tacking back and forth in the narrow strait. Furthermore, there must be a surface flow of water caused by the wind, which carries Aomi back. Even when it is possible to sail windward, the sun undoubtedly sets on the way, and Aomi runs aground in the dark. How long does the wind blow? What will the wind be after Aomi rounds Cape Froward? What do I have to do to save Aomi? Everything is unknown. No one can help me, of course. Whom I can rely on is just myself, but I have deeply understood that I can do nothing in such high wind. In a narrow strait or channel between mountains, it is necessary to pay the closest attention to the direction of the wind. A slight change of the true-wind may cause a significant variation of the wind and put a small vessel into danger. It is essential to read geographical features from charts or maps and estimate the direction and the force of the wind beforehand. Please help to translate the site. Free checks on the writing by native speakers are needed. This is an episode of Aomi in the Strait of Magellan. Where is the southernmost of Africa? →　→　→　→　→　Cape Agulhas is the southernmost of Africa. Where is the southernmost of Australia? →　→　→　→　→　Bishop and Clerk Islets are the southernmost of Australia. Where is the southernmost of South America? →　→　→　→　→　Diego Ramirez Islands are the southernmost of South America. How was the result? We do not know much about geography, do we? One of those which we don't know is Cape Froward, the southernmost of the South American continent. Aren't the Diego Ramirez Islands the southernmost as answered above? No, I mean the southernmost of the CONTINENT! South of Cape Froward is just a group of islands. 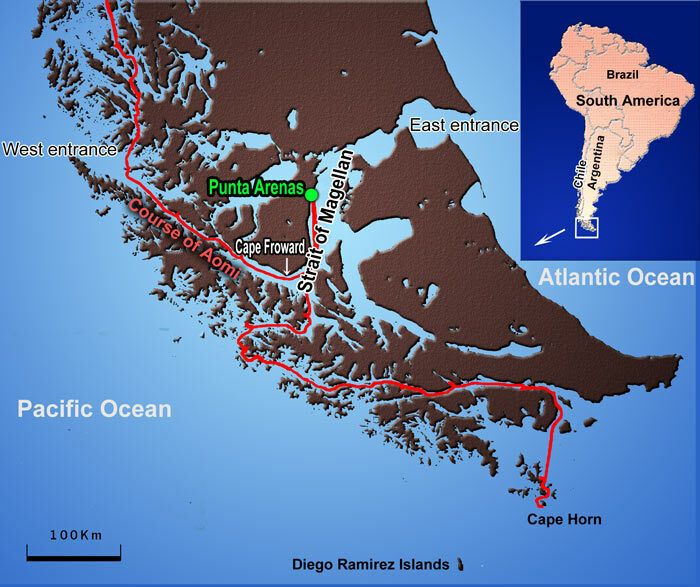 Sailing in Chilean Islands, Aomi reached the Strait of Magellan. 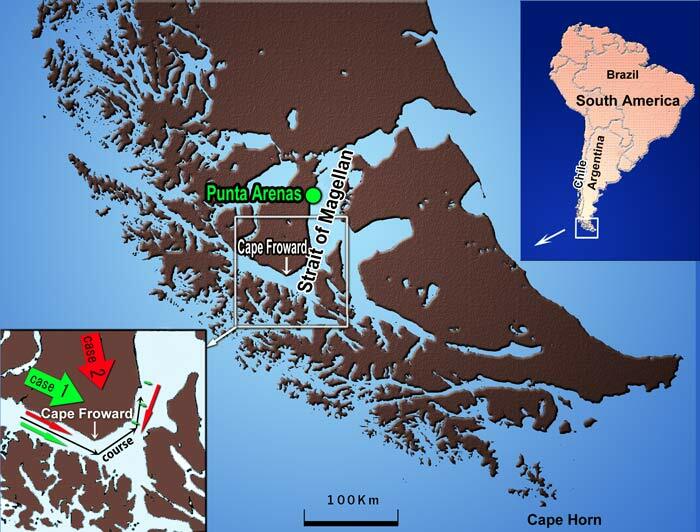 After rounding Cape Froward, Aomi will head for Punta Arenas which is a city having a population of about 120,000. There had been no chance to get food for more than two months because most of the islands in Chilean Archipelago are uninhibited. That was the main reason to go to Punta Arenas. Until the Panama Canal opened at the beginning of the 20th century, the Strait of Magellan was known as a passage from the Atlantic to Pacific. It is shorter than rounding Cape Horn and protected from the high waves of the open sea. Punta Arenas, situated at the middle part of the strait, flourished as a base of coal supply in those days. By the way, there are so many islands in this region. What is it like sailing there in a small sailboat? The remarkable features of the strait are the breathtaking scenery and the violent wind. See the photo above. The land on the left is Cape Froward, the southernmost of the South American continent. You can see the top of the wave breaking and dancing. There are parallel lines of ripples caused by severe wind on the blackish slope of the wave. 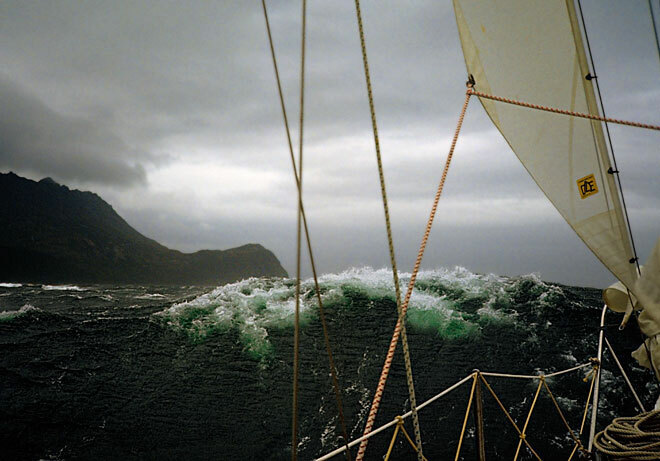 Furthermore, as you see in the photo, the breaking wave looks green― impressive green! The hoisted sail was only a tiny storm-jib of 2.4 square meters, smaller than a single bedsheet. Even with such a small sail, Aomi runs in the Strait of Magellan at a surprising speed. I pulled down the sail for fear, but Aomi was still running fast. The severe wind, blowing the mast and hull, was pushing Aomi to leeward powerfully. Why is the wind so strong in the Strait of Magellan? Try to image a shallow box with water and stones like below. When water flushes from the left, the velocity at the point B is higher than at the point A because it is narrower. At the point C, the speed of the water is much higher than at B, because the gap is much smaller. The speed of the flow depends on the width (cross-section) of the passage because the flow rate is constant everywhere. Please notice that the velocity is much lower without the stones. The speed at B and C will be the same as at A if there are no stones. Stones work as accelerators of the flow. When the prevailing wind blows from the west, the islands in the image above work as accelerators as described above, especially where the strait is narrow. That is one of the reasons why the wind is so strong there. It can be stronger than the wind at open sea. Sailing in such a wind must be a hard trial for yachtsmen. The photo below is Habana Point in the Strait of Magellan. Washed and polished with the wave and swell from the Pacific Ocean, the rocks look like weird white skeletons. "How harsh is the wilderness which makes the scenery? " At a glance, I realized what kind of place the Strait of Magellan was. I never forget the strong impact at that time. (Mouse over to show the map. Though the climate in the strait is so fierce, there are better days as well. On both sides of the strait, mountains continue, distant mountains are blue silhouettes, and high mountains have pale-white glaciers. Sometimes the sunlight spots the rugged slope of the mountain, and the rocks shine gold. In the next moment, clouds hide the sun, and the rocks become brownish violet at once. That was a mysterious scenery. It must be a fantastic experience to sail in such a place in a sailboat. While sailing in the Strait of Magellan, I saw just two big cargo ships. Though the importance of the strait is less today, some vessels, too big to go through the Panama Canal, still sail in the strait. When you are sailing in the Strait of Magellan in a small sailboat, it is better not to navigate at night even when you are more than two. You sail during the day and have to anchor in a bay at night. One day, Aomi stayed in a small bay called Playa Parda. There are snow-covered mountains in the back and weird violet-brown mountains in the front. The lines look like white-threads are waterfalls. Plants are scarce on the rock. The smooth surface of the rock, which looks like polished, makes us think of the severe climate there. "What an unearthly scenery it is!" as soon as entering the bay, I thought. After dropping an anchor, I rowed a small dinghy to put a rope to the shore. It is dangerous to rely on just anchors in the region where strong winds prevail. I looked for something to tie a rope to, but there was nothing suitable around there. What I found were just weeds or low thin trees. If there is nothing to fix a line to, the wind will blow Aomi away at night. Then I recalled a technique to set flukes of an anchor in the crack of the rock, that I read in a book before. I rowed back to Aomi, get an anchor of 13 kg, rowed back to the coast again. Unexpectedly, the angle between the fluke and the shank was too small for the crack, and the fluke came out of the crack easily when I pulled the rope. I decided to put the whole anchor in the crack, but every crack around was too narrow for the anchor. Finally, I took the anchor apart, removed the flukes, and made a cross shown below. (Genuine C.Q.R. Anchors cannot be disassembled like this.) I named it "Rock Anchor." By putting the cross in the crack, I fixed the rope on the coast firmly, and there was no danger of wreck due to the strong wind anymore. I awoke to hear the growls of wind at night several times, but I felt at ease because there was a rope between the coast and Aomi.